Hampstead School of Art teacher and critic Estelle Lovatt was born and raised in north London. She first attended the Hampstead School of Art, where she currently teaches adult education, as a child. Next, during art college, Estelle sat as a model for the portrait students to earn some side cash. After helping out in the school office she eventually worked her way up to her current position as teacher. 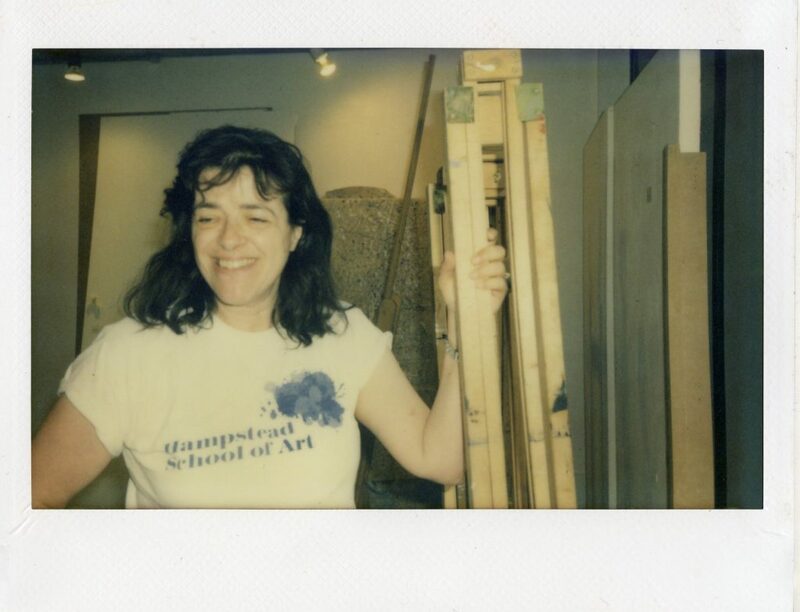 Over the years, she has grown with the Hampstead School of Art as they changed locations and expanded their curriculum. It is what Lovatt lovingly refers to as “a neighborhood nugget that more people need to know about.” In her life, art exists as a hobby, passion, and happy place. Just as Lovatt has two arms and legs, it has always been the primary force in her life. Were you a highly creative child? EL: I would work with any and every medium. A drawing is just a mark on a surface. You can make one with twigs in the snow. EL: Art gives me a place to escape to. How did you develop your teaching style? EL: I don’t think of myself as a teacher. I simply share knowledge on a subject that I know a great deal about. I go to a lot of exhibitions and read about art constantly. This is just something that I do and I’m lucky enough to get paid for it. How did you learn to coach young artists in such a positive manner? EL: The art world is a scary place because people automatically, subconsciously judge the creator about their presentation, choices they’ve made, and who they are as a person. I want to be helpful, encouraging, and positive to my students. I feel very lucky to work at the Hampstead School of Art and talk to people about a subject that I love. Would you say art is your way of understanding life? EL: Yes. My sketchbook is my portable studio. White paper and a pencil come with me wherever I go. I’m constantly looking, analyzing, and trying to work out what is happening around me in a visual way. What is the purpose of creating? EL: To make sense of the world. Many different avenues have served as my way of making thoughts cohesive and clear. What keeps you constantly interested in art? EL: Honestly, I’ve never been able to do anything else besides art. I’m not that clever. (Laughs) I never stop learning because art is a continuous process. The art that is created today couldn’t be more different than the work that is created tomorrow. EL: It provides stability and comfort. Seeing Matisse or Van Gogh is like visiting my grandmother. I’m never truly alone. Also, artwork doesn’t judge you, although we tend to judge it. Maybe art should be moved to the bottom of Maslow’s Hierarchy of Needs, as something which completes you as a person, similar to food, water or shelter. I agree. What is the secret to developing your own style? EL: You have to allow it to find you. That only comes from drawing, painting, and creating constantly. How did Cubism get started? It’s not that an artist said, I need to find a new voice. They were trying to describe what they saw in a way that hadn’t been done before. They were searching for their own unique language. Some artists change the course of history. Others just create pictures that cover cracks in walls. Both are contributing to the world. How do you know if it’s worth pursuing art as more than just a hobbyist? EL: Choosing an artistic career is not a conscious decision but rather out of your control. The life consumes you. It’s all you think about. What is your favorite artistic period? EL: I don’t have one in particular because I think artists should be open to all avenues. Knowledge is power and perception is reality. The more information I consume, the more I can pass on. Learn more about the Hampstead School of Art here. Is it true she married radio presenter Charlie Wolf? That is quite hard to fathom. Charlie never even had a girlfriend in his adult life, it would seem — and then this. He used to tell the staff at Atlantic 252 that he masturbated in the bathroom several times a day at that time. The King of TMI. A crude and ignorant man with a big mouth. Whatever possessed this woman? I have never heard that Tammy but thanks for reading and commenting!